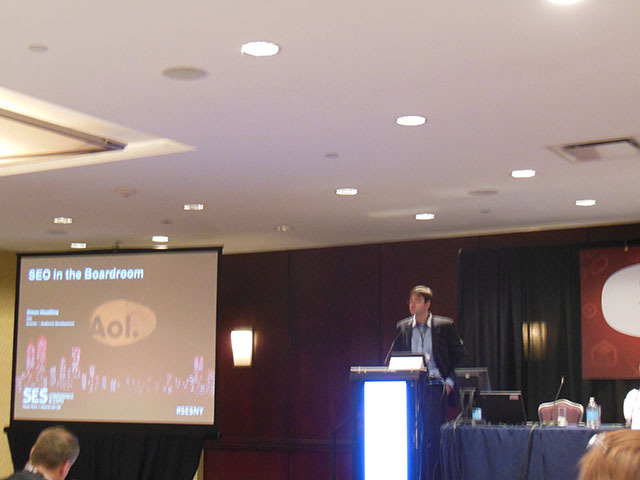 One of the interesting sessions from SES New York was how to show the value of SEO to the board of directors. This was in the “SEO in the Boardroom” session, moderated by Simon Heseltine, For all those in SEO, we have heard too often the question “What is the value of SEO”?, and “Why should I pay for this “free” traffic? Seth Besmertnik, the CEO of Conductor Inc, was the first to present in this session. Seth started by stating there is a consumer revolt going on. Marketing has changed to adapt, from outbound to inbound. There are 3 billion searches every day on the internet, customers are expressing their intent, what they are looking for, what they are searching. Buiness are trying to keep up by hiring at an unprecedented pace. Content goes through many stages and many hands. There are different people that play a role, content marketers, brand managers, marketing team. Therefore it is important to get leadership support for SEO. The SEO Function scales horizontally rather than vertically. How to deliver SEO insight that is effective for someone in the leadership team to understand? 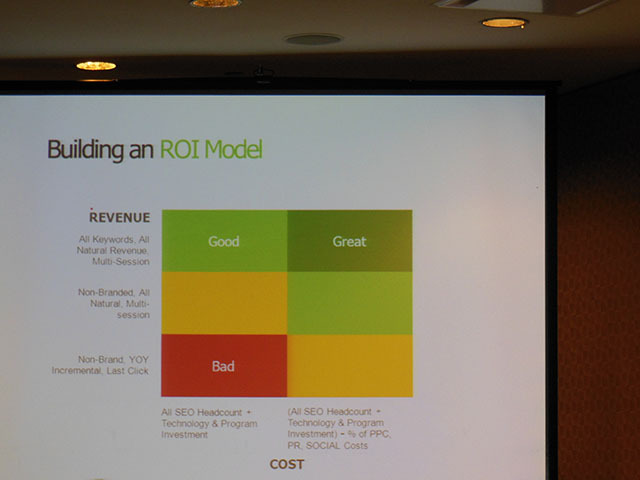 What is our ROI/revenue performance? How are we tracking against our KPIs and milestones? How do we compare versus the competition? Leadership across the board do not want to be beaten by their competition. 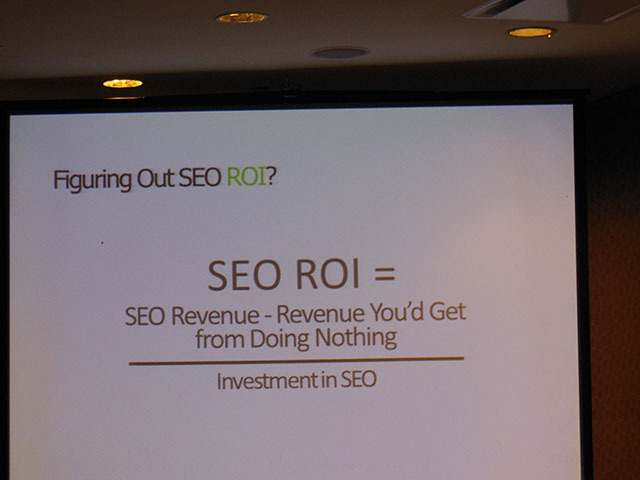 SEO ROI = Figuring out SEO ROI? The most aggressive way to do this is do attribution modelling for all keywords. Or you could filter out your brand terms. The cost is your salary. What is more aggressive is paid search using some SEO data to make them do their job better. This would also help with social. KPIs and Milestones: Rank Performance – put notations on this report. You need to think about explaining the market to the board especially is traffic is down. For example, How often are we beating our competitors? If traffic is flat but competitor data is going down then that is good. Executives realy care about keywords. You show them the keywords they are performing for, they love it. But if they are not ranking high, they do not. Chuck Price from Measurable SEO started his presentation by asking the audience “Remember when it was easy to demonstrate easy SEO?” If you were ranking on page one this meant you were successful. It is not like this anymore. SERPs are still a valued SEO metrics but it is flawed if that is the only metric you use. To reach a page one may require breaking webmaster guidelines and risking a penalty. SERPs are not served up the way they used to. Ae we all know, there have been many updates since 2007 including personalised search. 40% of searches are Google suggest search. Then you have the incredible shirnking SERPs. in 2013 – Business and SEO objectives must be in sync. Rankings and traffic needs to yield measurable improvement in revenues and profits. Get the corporate buy in. If there is no buy in, there are no sales. Chuck gave us a few recommendations on how to get this buy in from the board. 1. Find a cheerleader inside the organisation to push through. A few highly enthusiastic supports within an organization can make a difference. It is important to enlise the support fo the in house team. There have been some people that have had negative experience with SEO so prepared to explain yourself. There are people that are scared of losing their job. What are their concerns, take it away? Have someone they trust/respect to win the team over. You are willing to give something for nothing. Timing is everything. Being pushy is not the answer to sales. Listen to what others are saying. Understand the business objectives and time your proposal accordingly. Follow up differently. If your proposal does not get buy in first time round, it does not mran that it is a bad idea. It is easy to lose people if a proposal is too complex. Complexity breeeds uncertainly and uncertainty is the enemy of closing hte deal. 9. What is in for me. Show people how adopting your idea will provide some benefit to them and make their lives better, easier, etc. Proposing new ideas means change and most poeple afraid of change. It is hard to get even the best people to get your buy in. It does not require fancy analytics software, you can set this up in GA.
Look at your top content, find your worst content as well – eliminate and re do. Find your most linked content and market it please.